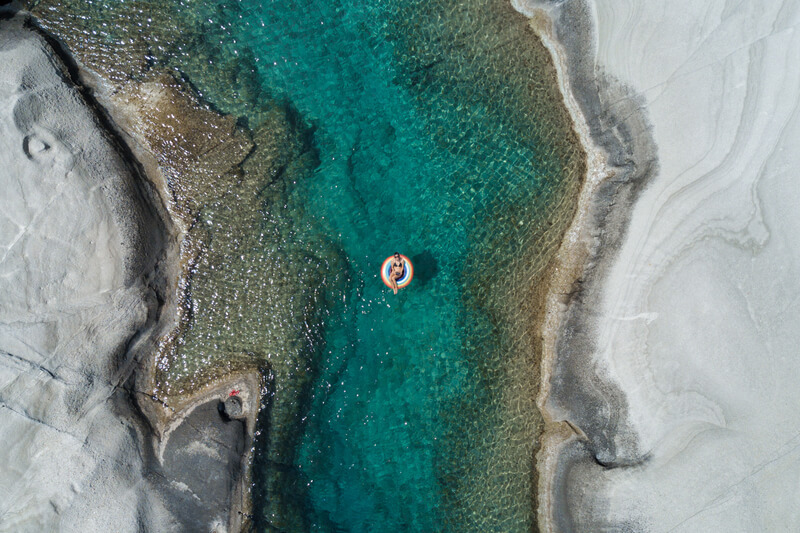 Renee is a world traveler whose images and dronies from around the world have attracted a dedicated social media following on her Instagram and blog. 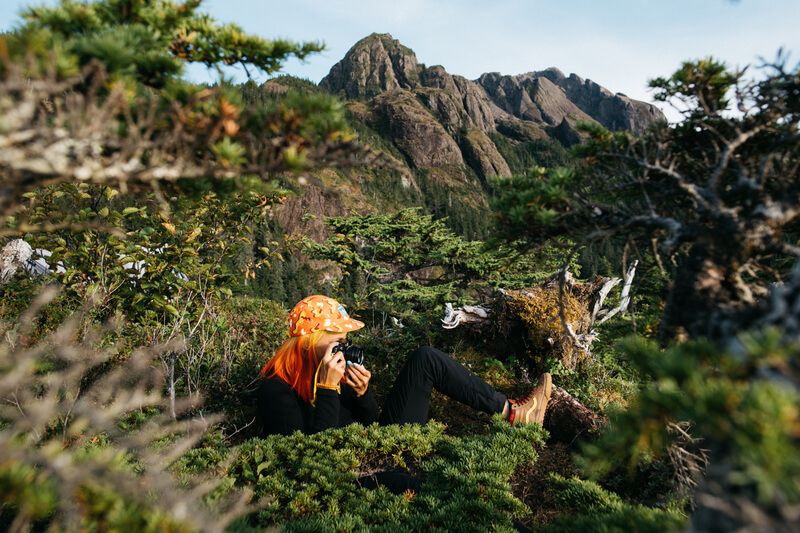 A California native living in Los Angeles, she is always looking forward to the next adventure in remote, natural places untouched by modern industry and technology. By working as a freelance designer, and through partnerships with brands, Renee has found her way to every continent on Earth and nearly 50 countries in search of new experiences, new friends, and the next epic dronie. Renee seeks to create and share colorful, awe-inspiring images from around the world, meanwhile never taking the idea of being an "Instagram Influencer" too seriously. When she’s not traveling the world, Renee enjoys hanging out with her cat, her dog and her friends on hikes, on bikes, by the pool and in the ocean. Talk about your development as a photographer. When did you get your first serious camera, what kind was it, and how did you educate yourself about photography? I have been shooting since the old days when all photography was film photography. I was an introverted kid from a sleepy suburb of San Francisco, so when I got to hang out with friends or go on a family road trip, it was very exciting, and I wanted to document it. The photos weren’t anything special, but they were a way for me to remember and relive more exciting times when I was back in my regular routine. Photography for me has always been an escape from mundane life. Nowadays I still shoot for the same reason, except that the times and places are infinitely more photogenic and exciting with international travel to faraway places. I shoot and share these experiences, minimizing (or entirely excluding) how I spend most of my time—staring at a computer screen or stuck in traffic in Los Angeles. Though I have had no formal photography training—I shot in AUTO for the longest time—I have learned a lot by doing over the years. My eye comes from an education in architecture and a career as a visual designer and I am always looking to compose shape and color. These days I still love to shoot film. I think it is ingrained into my subconscious that film is how memories are supposed to look—reality, but with a little less clarity and a slight shift in color. My drones and digital cameras capture such high-resolution, crisp images, I’ll usually go back and edit them very slightly to look like film. Like, maybe these digital images captured how a place really looked at the time, but they don't feel quite right. When did drones become part of your toolkit? The first drone I ever saw was in early 2014. I was at my friend, Jen Stark's, art event in an industrial area of Downtown LA. It was nighttime, and somebody was flying a white quadcopter overhead. Everyone at the event stopped what they were doing and watched in awe while this tiny UFO flew above us. At the time, drones were a new thing and I had never seen anything like it—the way it moved, how it hovered in place—and it was love at first sight. Within a week I bought myself a Phantom 1. Drones were not yet considered tools for photography—you could attach your GoPro to it, but without a gimbal, most of the footage was shaky and unusable. I had never seen photos or videos shot using drones, so I was excited by anything I captured with mine. 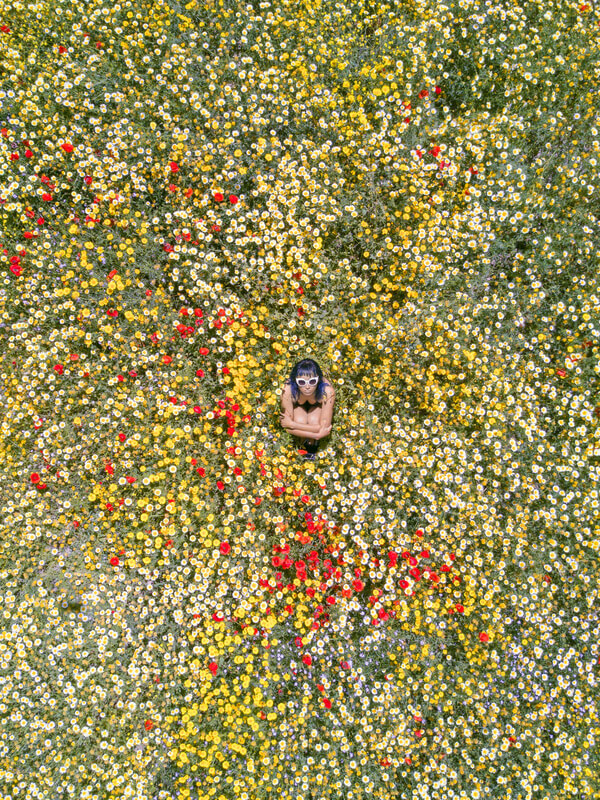 With my precious 5-7 minutes of battery life, I experimented with how and what to shoot, and when I started playing around with drone self-portraiture, my creativity really sparked. I continue to experiment with different cameras, bouncing between the latest digital cameras, old film cameras, and various photography apps, but my drone (although the models and capabilities have changed) has been a constant in my photography kit. 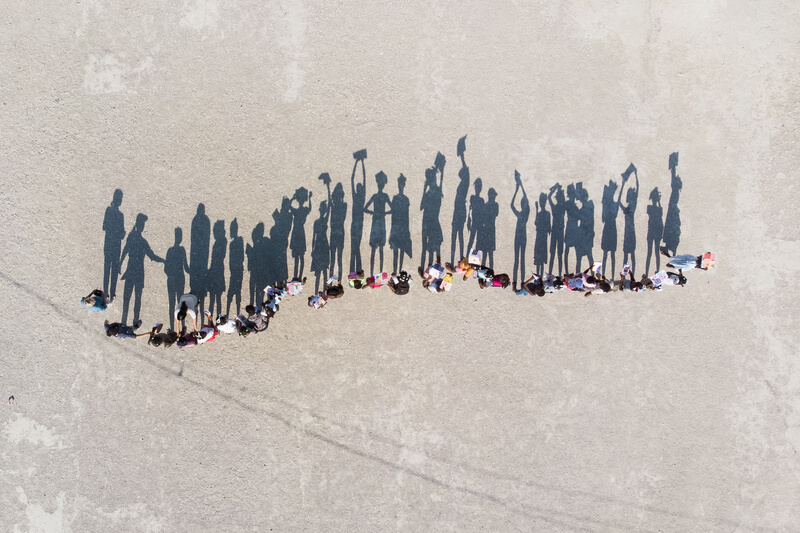 Playing with shadows in Gonaives, Haiti with girls in the Lide Haiti arts program. I have loved travel from the start. For me, having new experiences in places that are less explored, more natural and more remote is the most fulfilling use of my time on earth. I want to be immersed in the unfamiliar, which is challenging because, with social media, we see everyone everywhere every day. Of course, there are still lesser known places I hope to visit—Eurasia and the Stans, the Falkland Islands, Russia’s Arctic, remote islands in the middle of the Atlantic. But then, of course, I will be contributing to those places being on the mass tourism radar putting their unique cultures and landscapes at risk. What has been your experience with traveling with your drone? Traveling with a drone has gotten more challenging over the four years that I’ve been doing it. Regulations keep popping up in places where drones were previously allowed. It must have been really cool when you could get away with flying a drone at the Grand Canyon and other National Parks five years ago, but I completely respect and agree with the need to restrict drone use in them. The advantage to traveling to extremely remote places like Siberia or Greenland is that there aren’t many people around to have a problem with you operating your flying camera. In many places I have gone, it has been the locals’ first time ever seeing a drone and I get to relive that first fateful night by finding the same wonder and awe in other people’s eyes. More often than not these have been positive interactions that allow me to connect with people in places even when we don’t speak the same language. What is your lifestyle like these days? I do a variety of creative work to afford my dream, which is to travel. When I’m not jet-setting, I live in LA and work as a freelance designer. When I’m home, I am lucky to have a great relationship and steady work with a digital advertising agency that allows me to pick up and leave to travel with relative freedom. Brand-sponsored trips and licensing my videos and photos have also helped to supplement my travels. Tell me about your experiences with Social Media, being an “Instagram Influencer"
I have been using Instagram for the last 6 years—first as a personal diary for sharing photos of my local Los Angeles hijinx (pool parties, goofing around with friends) and then, as I started to travel more, as a gallery for photos from around the world. Millennials have grown up on social media, and I am grateful to Instagram for giving me a platform to develop as a photographer and an audience with which to share my journey. As my following grew to tens of thousands, I was able to form brand partnerships and other paid opportunities that have offset much of the cost of travel. So what do you think is next, what content would you rather be sharing? I would love to continue to be a photographer and drone photographer, traveling and telling visual stories about the places that I visit, and I am ready for life after the selfie. As I have seen more parts of the world, it has expanded my awareness of political, social, and environmental issues and I want to share images that inspire something more substantial than simply wanderlust. Earlier this year I traveled to Haiti to volunteer teaching art to girls with the organization Lide Haiti, which was a wonderfully fulfilling travel experience. I just finished a trip to Alaska, which was easily my favorite trip in the last year. For having been all over the world, I was still blown away by the natural beauty of Alaska. It has a lot of wild open spaces where you can fly a drone, and September was a fabulous time to see the scenery change with the fall colors. I camped with brown (grizzly) bears, walked on glaciers, hiked to an abandoned mine, flew in a plane to the highest mountain in North America, caught my first glimpse of the northern lights, witnessed salmon spawning, and saw so many more wild animals including a pod of orcas, wild moose, sea lions, puffins and more bears! I am still editing down the hundreds of photos I shot and am writing about my experiences on my blog!